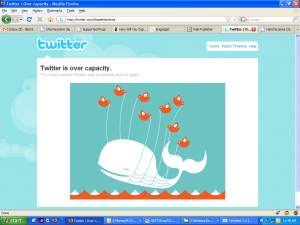 I guess Twitter is expanding to quick. Been getting the overload page throughout the day. Recently the Komodo (Edit) developers added a new feature to Komodo 5.1, that feature is abbreviations. The abbreviations feature allow you to quickly replace certain keywords with snippets of code by just pressing CTRL + T (or your key of preference). This can be extremely useful. I decided to create an abbreviation library for CodeIgniter. MyController is highlighted by default for easy replacing. Here is my current library. I’ll update it as I add more items. Putting the past behind me and moving on. It’s been almost 5 months since I officially left Simple Machines (SM), for good. I was part of the team since November 2005 and for the most part it was a great experience being part of the team, I loved it. However, like everything else, all things must come to an end. No organization is without its flaws, some flaws are bigger than others. Simple Machine is not immune to this. It might not be obvious to some but there has been in-team fighting for almost a year now. Some people credit the Meeting of the Minds (MotM) and the biggest contributor to all of this. The MotM was great because some friendships were developed but on the other hand it broke friendships. Personally I got to learn how some people truly are and their motives. After the MotM issues upon issues started to stack. Most of them went unsolved and many just beat around the bush every time the issues came up. One of the biggest issues was the fact that – at the time – SM had only one partner and it was like that since the LLC was formed in 2006. This was unacceptable to some. Many started to see this as a lack of trust for the current partner. In reality, what the system needed was checks and balances. If something were to happen to that person the project would’ve been in the air. This was just one of the many issues. Another issue was that the whole structure of the project needed re organization. The team had outgrown the ‘structure’ that was setup. Some people were not willing to compromise and make the change that was long overdue, starting from the Project Managers all the way down to regular team members. Personally my final blow was the direction that the team was being led to. My problem wasn’t actually the direction but the way that it was being done and how members were manipulated and in some cases, some members feared the ‘higher ups’. It got to a point in which I lost total respect for a certain individual and to this day I haven’t gotten any sort of respect towards that person. In fact I’m getting to a point where I resent that person and everything that they stand for. That said I do appreciate some of the things that they did for me. You can say that I got to where I did in terms of knowledge because that person pushed me to learn more and better myself. I understand when one or two people on your team tell you that you’re the cause of the problem and you just ignore it. Hey it could mean that they just don’t like you. But you have a handful of key people telling you that you are the problem and you blatantly ignore them, then there is a problem. IMO incompetence, if used right, can be a dangerous ‘tool’ (for a lack of a better word). When you are incompetent and you know you are, you tend to find ways to make up for it. Sometimes these methods that you use just make it worse. What I mean is that you tend to find ways to ‘eliminate’ those that you feel are competition to you, even if they are not. You start making things up in your head. I won’t develop more into this, I’ve said enough about this and you can get the picture. With all this brewing things got pretty bad and the end result was not a happy one. Depending on how you see it. There were a few of us that ended up leaving the project and moved on in life. To this date, things are a bit sour between a few of the members that have left and those currently on the team. Some say that we left because we were part of the problem or that we don’t care about SMF. In reality, I for one still care about the project and hope it succeeds; I just don’t really care about some of the people behind the project. This does not include past and current developers. I have nothing but love for each and every single one of them. There are others outside the Dev team that I still have respect towards them. Now on to bigger and better things, not everything ended in a sour note. Some of us have kept a close relationship and views. We have started to push these views forward. In what way you may ask, we recently officially formed a NPO. If anyone is interested you can check us out at YouraSoft. We hope that this will mark the beginning of a great future. As for me, Juan aka Jay… After taking a semester off from school, I transferred into the Bachelor of Technology in Computer Systems program at New York City College of Technology and I’m back in action. This semester I’m taking “College Algebra and Trigonometry” and “Intro to Psychology”. I like the professor for the most part. Don’t really like the school though. It is too damn disorganized. I transferred from a CUNY to a CUNY so they are supposed to have all my records. THEY DON’T. They even went as far as having me as an out of state student, asked for my immunization records, proof of address and this week I got a letter saying that they need my High School diploma. To top it off the transfer department gave me 2 classes that I didn’t even need to take, had to drop them. They put me in this computer class that 99% of the class had an average IQ of 10 in computer related knowledge. Work and school have kept me pretty busy but, I haven’t been off the programming scenes completely. 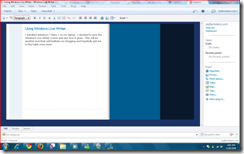 Recently I picked up on CodeIgniter – which I’m loving – and have been using it to work on JetSetCafeClub.com. I wrote an ecommerce site so that they can sell tickets to their events. At the moment, the site is running a beta version. Check it out and feedback is always welcomed. Also, I’ll look into posting a demo up. As I hit towards the end, I’ll make a post devoted to it and explaining the system more. To end this on a happy note, I’ve been reading a lot about Android and I expect to start writing applications for the platform. Also, soon I’ll start to study for the Zend PHP 5 certification. Hoping that goes well. I just updated to wordpress 2.7 and I’m loving it. I did some house clean-up and deleted a mess of spam and what not. I installed Windows 7 Beta 1 on my laptop. 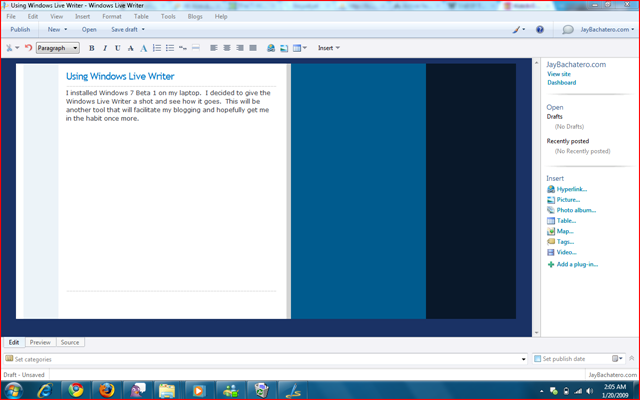 I decided to give the Windows Live Writer a shot and see how it goes. This will be another tool that will facilitate my blogging and hopefully get me in the habit once more. SMF 2.0 Beta 3 Public Released! The wait is finally over. The first public beta of SMF 2.0 is here! Simple Machines is extremely proud to announce the long awaited release of the first public beta of SMF 2.0… View the link for the full announcement.